Red velvet jester-style cap with bells en pointe. Additional detail includes yellow embroidery on back that reads "Cirque du Soleil." I've had this lid in the wings since the middle of March since I knew, from the minute I saw it, it would be perfect for an April Fools' Day post. It is on long-term loan to the extended version of the Project by our cross-the-street neighbor Byron Funk. "I think it looks perfect on you," he told me -- completely unaware of my borderline obsession with zany headgear. Of its provenance, Byron said: "I got it at a Cirque du Soleil show in Los Angeles about five years ago and I usually don't buy souvenirs but this was something special." Funk's traditionally paired this well-made, upscale cap (let's call it "jester formal," shall we?) with a black suit for Purim festivities, though this year his wife Reva told me he decided not to. A couple of weeks later the Funks called me over and presented me with this glorious fool's crown nestled in a huge Robinsons-May hat box. The best part, to me, is that even though the Funks weren't aware of my proclivity for millinery, they somehow felt the hat would find a good home across the street. And that is where it will remain - with bells on. 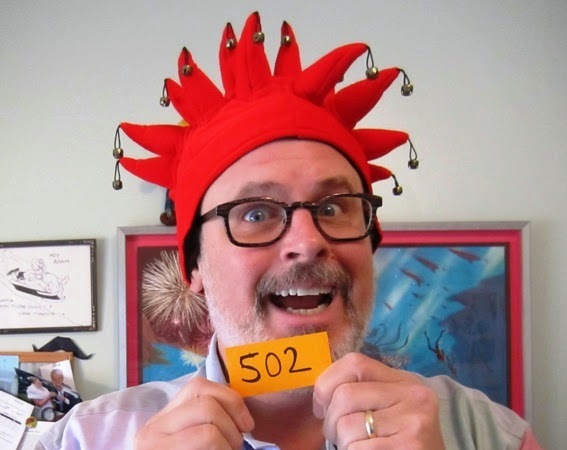 February 24, 2015: Hat 501 - Got Dairy, Dan?